Test your luck and take a chance at the dog race on your hen night! For some hens, their last night of freedom will not be complete without some light gambling. 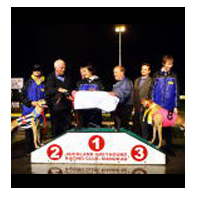 If you can relate to that, head to the nearest stadium and enjoy a night of dog racing! Your night does not have to end when the race ends! After the race, win or lose, you can go on partying at the nearest club or pub to splurge your prize money or drown your disappointment with alcohol. Still, win or lose, you still have reason to have a lot of fun! So, continue to an after party. Drink and dance until you the wee hours of the morning. You can also choose to include some fund and wild hen party games to make the night even more memorable. Check out our ideas section if you need more information!